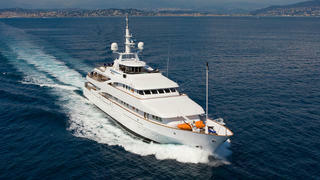 The 55.78 metre motor yacht Insignia, listed for sale byYachtzoo, has had a price reduction of €1,000,000. Built in steel and aluminium by German yard Elsflether Werft with naval architecture by Alpha Marine, she was delivered in 1979 and fully refitted in 2004 when her current owner bought her and changed her name from Hanse to Insignia. In 2007 her hull and superstructure were shot blasted and repainted in Awlgrip. MCA compliant, her high volume interior designed by Luiz de Basto accommodates 14 guests in seven sumptuous cabins. These comprise a master suite forward on the main deck while below lie a VIP suite, two doubles and three twins, all with entertainment centres, television screens and en suite bathroom facilities. In addition, there are quarters for 12 crew on this yacht for sale. The main deck saloon lounge area oﬀers a bar to port and two large sofas, occasional chairs, an entertainment centre including a 55 inch large screen TV and a library of films and music. Separated from the lounge by a central staircase, the formal dining area has seating for 14 guests. Upstairs, the glass-enclosed sky lounge is entirely devoted to relaxation with comfortable seating, panoramic views, a large flat screen television and a stereo surround sound system. On the sun deck, al fresco entertainment and dining is available with a wet bar, background music, a Jacuzzi tub forward surrounded by large sun pads and a selection of gymnasium equipment. Twin 12V 652 MTU diesel engines give her a cruising speed of 12.5 knots and a range of 3,700 nautical miles. Lying in Athens, Greece, Insignia is now asking €7,500,000 with VAT paid.